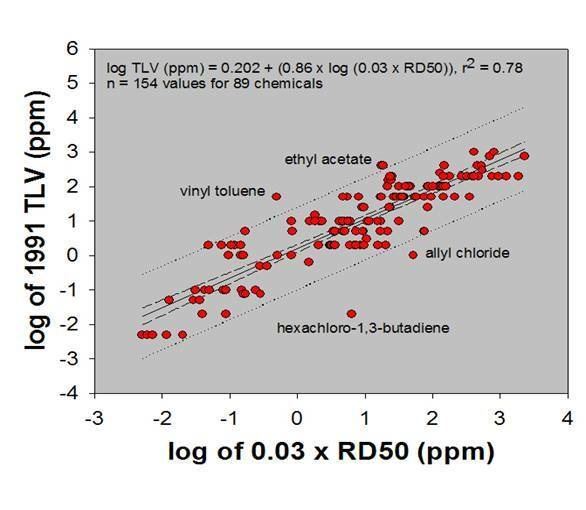 Correlation between RD50 and TLV. Regression line, 95% Confidence Interval and 95% Prediction Interval. Authors: Alarie, Y., Nielsen, G.D. and Schaper, M.
Title: Animal Bioassays for Evaluation of Indoor Air Quality. In: Indoor Air Quality Handbook. Editors: J.D. Spengler, J.M. Samet and J.F. McCarthy.